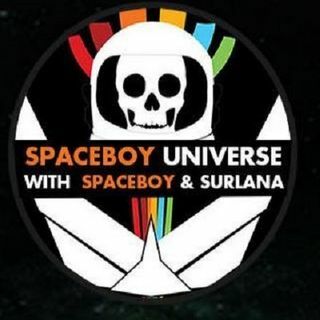 Join Spaceboy and Surlana as they celebrate reaching one year of brodcasting SBU. Love you SB & Surlana o much!!!!! :kissing_heart: :kissing_heart: :kissing_heart: :kissing_heart: Here's to another year!!!!!! Cheers to the Spaceboy Universe and the Spaceboy Universe Cadets! Now we've just got 4 more hours of listening with Jimmy on Coast in about 5 minutes! If I don't see you all over there in the sandbox, a most wonderful night to all! Thanks again Spaceboy and Surlana. Happy Anniversary guys. Night space cadets. Good Night, surlana and SB!!! Fun Night! Ty says good night to. Have a wonderful evening all you Spacecadets!!!! All of you have a great night!